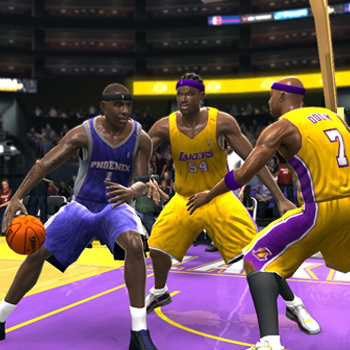 Delivering the most engaging NBA experience with fast, fluid gameplay, NBA '07 for the PSP expands upon the franchise by offering the most feature-rich, handheld NBA action available. Officially licensed by the NBA, and introducing all-new gameplay modes, mini-games, and presentation, NBA '07 is ready to deliver the thrill of and excitement of NBA action on the go. An all-new Conquest Mode allows players to take a team and challenge NBA squads across the country, while a new Pick Up Mode give gamers a chance to choose from 10 different NBA players for a playground-style match-up. In addition to the instant replay function, a new Highlight Reel option provides players the opportunity to view a select reel of highlight shots, passes, steals, and dunks at the end of each game. Players will also have more choices of quick pick-up-and-play mini-games, including an all-new rhythm-based dunk contest as well as carnival-style games including skee-ball, pinball, and pop-a-shot. Additionally, the game brings back popular mini-games such as Dodgeball and HORSE, as well as a comprehensive ladder challenge and virtual trading cards.